If you love the feeling of opening that tiny little door on your advent calendar each day in December to reveal the treat inside, you’ll love opening up the offers in Bucky Bingo’s Christmas Calendar. This promotion runs right up until Christmas day and has a different prize every day for you to claim and enjoy at the site. The surprises lurking behind the doors of Bucky Bingo include bonuses, free spins and much more- so don’t miss out. There’s a brand new treat waiting for you every day at Bucky Bingo. Click to Play Now at Bucky Bingo Get £20 Welcome Package + 70 Spins + 14% Lifetime Cashback & 200 Points! Min dep: £10 on each deposit. 1st 3 deposits only. £10 cash staking on bingo required for £10 Bingo Bonus (4x wagering, 4x cap) and Games bonus and Rainbow Riches spins (50x wagering, 4x cap). T&Cs apply. If you want to find out what bingo offers are waiting for you behind Bucky’s Advent Calendar, simply sign into the site and make your way over the promotions page. There you’ll find the calendar ready and waiting to be opened. You won’t want to miss a day as those offers just keep on getting bigger and better the closer to Christmas we get. Be sure to keep an eye on Bucky’s social media accounts as well, as extra treats might just be announced on Facebook and twitter during the run-up to the big day. Newbies to Bucky Bingo are more than welcome to get involved with this offer. Sign up for the site now to enjoy the best bingo this festive season as well as the wonderful welcome offer of £10 and 70 free spins. 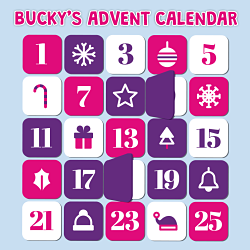 Bucky’s Advent Calendar is open to all registered members of Bucky Bingo. The promotion will run from the 1st until the 25th of December. Bingo bonuses awarded in this promotion come with a 4X wagering requirement. Winnings from the free spins are subject to a 25X wagering requirement. Other bonuses and prizes may come with their own individual terms which will be stated on the website. Benefit from our exclusive cashback when you register a new account with Bucky Bingo today, and we'll give you 14% back if you don't win!